This article by Don Ursetti originally appeared in The Court Reporter (Vol. 3 Issue 30), a newsletter of the Summit County Juvenile Court. A program highlighted in an earlier edition of The Court Reporter was recently honored by the Ohio Department of Youth Services (ODYS). 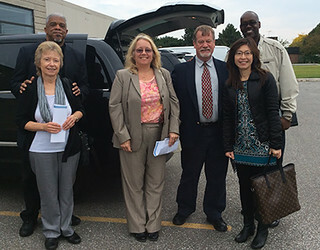 "Designing Identities" is a creative writing class that was first introduced to the Juvenile Court's Detention Center over six years ago by Kent State Professors Dr. Kristy Pytash and Dr. Elizabeth Testa. The concept was to give youth in Detention the opportunity to spur their interest and, even better, their imagination by asking them to express themselves on paper. One youth did just that, in stunning fashion, and was also a winner of one of the ODYS Community Recognition Awards. "Programs such as this one are exactly what Judge Teodosio is looking for," said Detention Superintendent Melissa Gerney following the awards ceremony. "She is always looking for new and unique methods to give the youth in the Detention Center something positive they can take with them when they reenter the community." 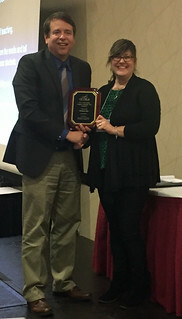 On November 29th, the Ohio Department of Youth Services recognized the program with its Director's Award, the highest honor given to Juvenile Court programming, during the Ohio Juvenile Court Judges' Winter Conference in Columbus. ODYS Director Harvey J. Reed noted in his introduction of the award that Designing Identities, "offered both prose and poetry. As the youth became more engaged in the creative writing process, the program then allowed youth to begin work on other projects. While writing is still the central theme, the youth have also been invited to flex their creative muscle in other ways. The program has evolved. It now allows youth to sculpt clay, build elaborate mechanisms from scratch using paper and plastic, and use computers to create pictorials and presentations." Ms. Gerney accepted on behalf of the Court, marking the fourth time the Court has received an ODYS award. "I am so pleased that the Department of Youth Services chose to honor the program," said Judge Teodosio. "From the very outset, you could see the volunteers and youth in Detention working so well with each other. It is a partnership that I hope continues for the foreseeable future." 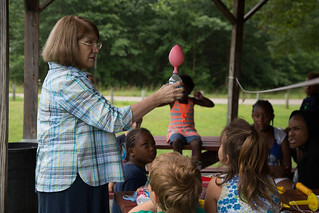 Summer 2018: Funded by the Martha Holden Jennings Foundation, and directed by Dr. Kristine Pytash and Dr. Elizabeth Testa, Kent State Master of Arts in Teaching (MAT) preservice teachers worked with teachers from the Summit County Detention Center to design a curriculum that emphasized critical inquiry, culturally responsive pedagogies, and design-based learning. Over the course of three weeks, youth engaged with critical issues connected to the city of Akron. The MAT preservice teachers taught lessons that included designing logos and a social media campaign for the city, redesigning Route 59, reconceptualizing spaces within the city, and using digital media to compose photo essays. Students participated in a Learning Showcase for community members that highlighted their conceptions of public spaces, their understanding of the scope of purposes of these spaces, and opportunities for citizens to share their interests with the City of Akron. The School of TLC gathered to wish Dr. James Henderson best wishes on his retirement (May 2018). (shown here with some ECED alumni) shared their final projects in an IB Exhibition Night in May 2018. 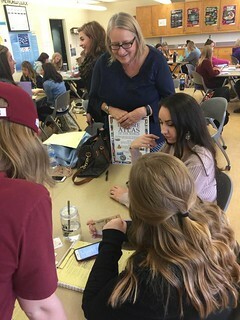 (2016 and 2017 graduates) met with current INSS student teachers in April 2018 to answer questions and to discuss the transition from being a student teacher to working as a first-year teacher. Alumni also discussed their experiences finding their first jobs and the challenges facing novice social studies teachers. planning for Family Reading/Language Arts Night at Litchfield Middle School in Akron, Ohio, Spring 2018. Each semester, our MCED Teacher Candidates create a Reading/Language Arts Family Fun Night to provide an evening of hands-on/brains-on language arts activities held at local middle schools in the Akron community. Students, parents and family members work together to read, write and experience language arts activities. This event allows teacher candidates to develop their expertise in engaging young adolescents and their families through interactive language art experiences. 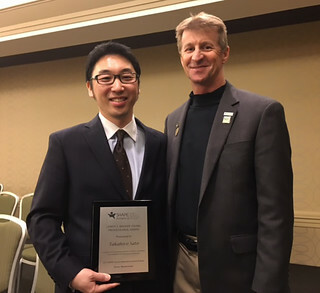 a TLC doctoral candidate in Curriculum and Instruction with specialization in Mathematics Education, was awarded a University Fellowship from KSU. The University Fellowship is awarded annually to advanced doctoral students to recognize excellent scholarship and research potential; it enables recipients to commit their time to dissertation research or writing. Rashmi was the first doctoral student from TLC to be awarded this fellowship. As part of the University Fellowship I am working with my PhD advisor Dr. Karl Kosko, enquiring into the role of structure of number sentences in elementary students’ conception of mathematical equivalence. The emphasis of my work is on place-value with whole numbers and position of unknown in a given number sentence. We have identified some potential misconceptions of equivalence which are prevalent in elementary students and might potentially hinder students’ overall success in algebra. Based on these findings, we have designed and piloted new assessment and developed a new construct map of equivalence knowledge by improving on the existing frameworks. Students’ misconception of equivalence in elementary grades is thoroughly researched and well documented. However, some unconventional sources of students’ misconception in this important area are overlooked. The importance of our work is that it provides an improved set of assessment tools for researchers and educators to identify some of these unconventional sources of misconception. We hope that our findings will contribute by helping researchers and educators in developing the proper 'relational' understanding of equivalence among the elementary grade students. 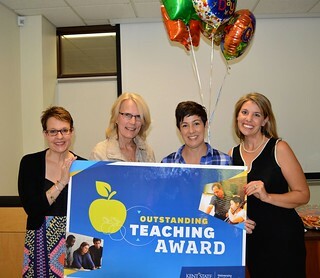 won the 2017 Outstanding Language Arts Educator Award (University level) from the Ohio Council of Teachers of English Language Arts (OCTELA). who were recognized for their outstanding achievements at the 2017 SHAPE America National Convention in Boston! 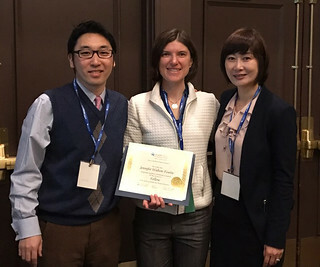 Dr. Walton-Fisette was named a 2017 Research Fellow of SHAPE America; Dr. Sato received the LeRoy T. Walker Young Professional Award; and Dr. Mitchell was named an NAS Fellow through the North American Society of Health, Physical Education, Recreation, Sport & Dance Professionals. 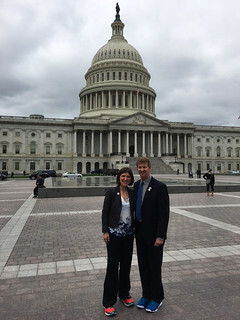 Dr. Walton-Fisette and Dr. Mitchell were in Washington, DC in April 2017, where they met with Ohio legislators to advocate for physical education and health (note the eye-catching neon sneakers!). 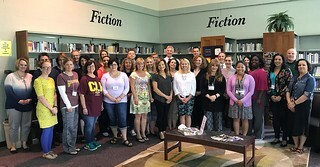 (ten from Maple Heights and ten from Aurora) constituted the second-year cohort of our three-year Ohio Department of Education Teacher Leadership grant. 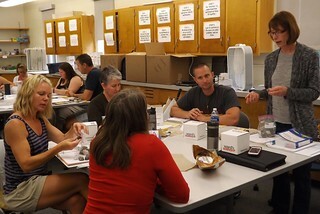 The teachers took the four courses in our College of EHHS Teacher Leader Endorsement Program (TLEP). 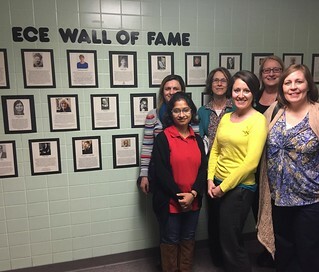 outside White Hall 302, created by Dr. Marty Lash and her graduate Early Childhood class. 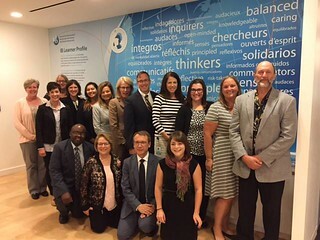 Dr. Marty Lash and Dr. Robin Dever attended the IB Global Conference in Orlando in July 2017. 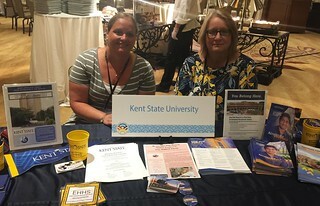 Dr. Lash is Kent State's IB Primary Years Programme Coordinator; Dr. Dever is the Middle Years Programme Coordinator. 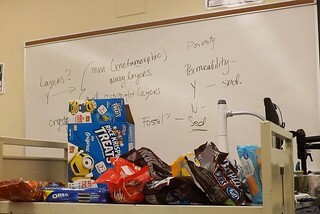 taught by Dr. Bridget Mulvey, exercise their analytical skills on snack foods before moving on to rock samples. This course was funded in part by the Ohio Department of Education's Improving Teacher Quality Grant Program. 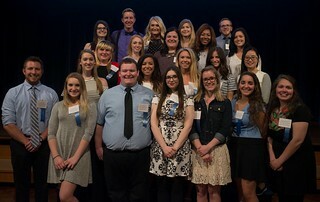 Congratulations to our 2017 TLC student award winners! 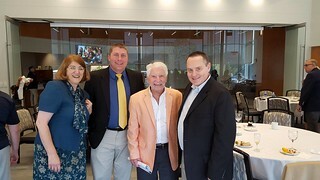 Dr. Joanne Caniglia, Dr. Karl Kosko, and Dr. Scott Courtney with Dr. James W. Heddens at a Kent State event honoring Dr. Hedden’s contributions as the first mathematics educator at Kent State. Heddens developed much of the undergraduate, masters, and doctoral programs emphasizing mathematics education at the university. 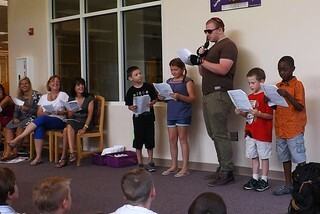 Dr. Marty Lash's Early Childhood students dive into "IB Around the World". 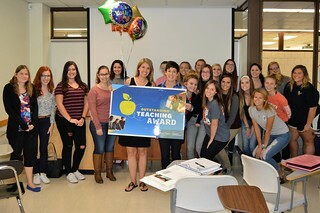 Dr. Rochelle Hostler received one of three 2017 Outstanding Teaching Awards!